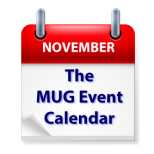 The Thanksgiving holiday in the U.S. takes its toll on The MUG Event Calendar, as usual, with most groups shifting their meetings or suspending them completely. Still, not everyone is on vacation. Chuck Joiner of MacVoices will present to a California group, while a Florida group will look at how autonomous vehicles may impact their community. Another Florida group will focus on Mojave, while a German group will look at Microsoft Office alternatives.